You are probably aware that sugar is bad for your teeth, but did you know there are other health habits that are just as hard on your teeth? Going to bed without brushing, or not flossing daily are habits that may stress your teeth and gums. 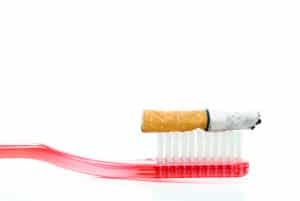 Tooth grinding and nail biting also fall into the “not helpful to teeth category.” Smoking has many health issues, so it may not come as a complete surprise to find out that we recommend smoking cessation, as teeth and tobacco don’t mix. Smoking cigarettes, cigars, pipes or using smokeless tobacco products affects the interaction of gums and teeth, and appears to interfere with the healthy development of gum tissue cells. This makes it easier for minor gum irritation and inflammation (gingivitis) to progress to periodontal disease. The fact that smoking affects blood circulation further increases the potential for escalation to periodontal disease. A very large percentage of people who develop cancer of the mouth, tongue, lips and throat are people who use tobacco products. We will screen for oral cancer at every checkup, but kicking the smoking habit is the best way to lower your risk of oral cancers. Just as exposure to dark foods and beverages will stain teeth, so will exposure to tobacco smoke and smokeless tobacco products. Although there are cosmetic procedures to remove stains, preventing them in the first place is an easier and more cost effective strategy. “Smoker’s breath” is caused by several factors. First, tiny odor causing particles from smoke can linger in the mouth and lungs, even when a tobacco product is not in use. Second, there are many chemicals in tobacco products that may impart unpleasant odor to your breath. When you add in that smoking tends to dry out the mouth, and that gingivitis or periodontitis may be adding bad-breath factors of their own, you have the recipe for unpleasant breath. Smoking is cessation is not easy, but neither is living with an unpleasant habit. A consultation visit in our office is the first step towards a tobacco free future.